I've only dealt with creative nonfiction in essays for adults. Simply Donna covers the subject in Nonfiction vs. Creative Nonfiction vs. Historical Fiction. I am quite worn out after a big day working on a project I will blog about some time in the future. I'm staggering here, so I can't even say when. While planning for and getting started on this mysterious project, I've been thinking a lot about blogging. I've been thinking that maybe it's on its way out. In fact, I told my sister so today when I managed to squeeze in an e-mail to her. There are just too many blogs. Newsweek claimed recently that there are 104 million. Readers are overwhelmed, giving up, and drifting away to Facebook and Twitter, which don't require as much commitment of time for reading. When there is just too much to read, readers may very well feel pressured to look for shorter forms for their reading. I don't have time to read a whole blog post from Meg Cabot, but I might be able to manage a couple of sentences on her Facebook page. Blogs used to be thought of as brief, but they're turning into a long form now, comparatively speaking. Blogging, though, is about writing in a way that I suspect Facebook is not, though I can't say I know for sure. For a writer, particularly a fiction writer, blogging gives an opportunity to work on some smaller thought projects, so to speak. Writing involves thinking, remember. It gives writers (or any bloggers) opportunities to work out their thoughts on particular subjects related to their fields. I was heartened to find, by way of Chasing Ray, On Getting Your Name Out There: Author Blogging. What I liked about it was that the author, Alexander Chee, treats blogging as more than just marketing. (Though he talks about that, too--"Don't be afraid to be a traffic whore.") He treats blogging as writing. "DO NOT blog your daily life unless it is attached to a moment of insight." That's getting close to talking about a personal essay. And his suggestion that blog posts could be turned into an essay or short story? Note he isn't talking about bloggers writing novels or memoirs relating to the blog. He's talking about something they've done within the blog being worthy of expanding. Suzanne Collins appeared at the UConn Coop last night. According to the announcement in our local paper, she was suffering from a wrist injury and would be unable to sign books. I wonder how a bestselling author would injury her wrist? Earlier this month, The Spectacle had a post called Gender-Neutral? about how conventional wisdom says that girls will read books with male protagonists but boys won't read books with female protagonists. Be sure to read the comment from Jan. Among the things she has to say is, "The boys who are excellent readers or sf/fantasy lovers will also read female centered stories, but not your average boy. Same is true of adult male readers of sf and fantasy." At Chez Gauthier, I used to "book shop" for the Gauthier boys, bringing in library books "on approval." (They kept up with their reading to a much greater extent than the sons of many of my friends, and I think it was due to the easy access.) One son liked YA humor, which I liked, too, and he read a lot of the YA humor I brought into the house. One day, he said to me, "You always bring me books about girls." I hadn't noticed, but when I began to think about it, I realized that a lot of the humorous books I was finding did have female main characters. It seemed to me that books with male protagonists seemed to be serious. This led me to write Saving the Planet & Stuff, which I intended to be YA humor with a male main character. You might see a little more boy humor for younger readers, especially since Wimpy Kid made the big time. If YA writers using a female protagonist want to keep male readers, they might want to avoid making their books too intimately female. For instance, in my experience teen guys aren't interested in menstruation humor, no matter how funny it is. Earlier this week Publishers Weekly announced that it is starting a Quarterly Service for the Self-Published. "...we are announcing PW Select, a quarterly supplement announcing self-published titles and reviewing those we believe are most deserving of a critical assessment. The first supplement will appear in our year-end issue in December. Each quarterly will include a complete announcement issue of all self-published books submitted during that period. The listings will include author, title, subtitle, price, pagination and format, ISBN, a brief description, and ordering information provided by the authors, who will be required to pay a processing fee for their listing. At least 25 of the submitted titles will be selected for a published review." The processing fee is $149. You're gambling on whether or not that will buy you a review. Several years ago, Kirkus Reviews started Kirkus Discoveries where self-published authors were guaranteed a review in a separate section of the KR website for a fee of $425 to $575. Evidently there are other publications that provide reviews for a fee that I had missed hearing about. One of the things I find interesting about this whole situation is that a year or so ago there was some kind of uproar on the Internet about whether or not litbloggers were accepting payment for reviews if they received an ARC or review copy. Accepting payment, even in the form of a ten dollar ARC that's really good for nothing after you've read it, was considered to be unethical. One hundred and forty-nine dollars is a lot more than the cost of an ARC or even a real book. In fact, all those publications are charging significantly more than the cost of a book. No one can deny that money is changing hands here. I guess I understand that the publications are receiving the payment from the author and not the actual reviewer, who is paid by the publication. I'm not sure how much difference this makes, though. I definitely enjoyed Maggie Stiefvater's first wolf book, Shiver. It's the first in a trilogy, and I wondered if it really needed a follow-up. I guess if you're into that storyline that involves characters forced to overcome obstacles in order to get what they want (as in true love), it does. Linger, that follow-up and Book Two in the trilogy, is still elegantly written. It just seems confused. I think Shiver had two first-person narrators. Linger has four. Just whose story is this? The characters seemed a lot more stereotypical this time around--tormented lovers, bad boy rocker, and bad rich girl. The bad rich girl is my favorite, and she was the one character who I was sure wasn't the lead. Things seemed a little more far-fetched this time around, a little less believable. I think it was because the narrative was less clear so it was hard to commit to the story and suspend disbelief. Still, I may pick up the third book when it comes out next summer. At the end of Linger I thought there was just the slightest suggestion that Beck might come back. He appeared gone for good at the end of Shiver. I'm also interested in that bad rich girl. 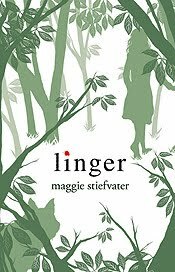 Linger is printed in green ink to match the cover. At first I thought that was going to be disturbing if not sick making. But oddly enough, each time I started reading, after a few pages the print looked black to me. Optical illusion? Scroll down here to see Linger's marvelous trailer. As I've said before, I prefer Roald Dahl's short stories to his children's books. Nonetheless, I was interested to learn that next month is Roald Dahl Month. It very conveniently arrives in time for the start of the U.S. school year. As part of the plan, kids can take part in a Dahlathon. I will be contacting our family's teachers directly. This seems like the kind of thing you should plan ahead for. Also, for you people who do like Dahl's children's books, a new book is coming out that includes a missing chapter from Charlie and the Chocolate Factory, as well as a few other things. Pimp My Novel tipped me off about this. Not To Worry! You Really Can Get To The Point Where It Just Doesn't Bother You. The beauty of submitting short stories and essays by e-mail to on-line publications is that the folks who publish those things work all kinds of hours and days. Thus you may very well find yourself receiving rejections in the evening or on Sunday, as I did yesterday. You can read a great deal about rejection at Rejection Revisited at Jill Corcoran Books. Being Dyspeptic about Dystopics at Oz and Ends. How to Create a Dystopia at The Spectacle. Also at The Spectacle: Beth Revis Discusses Dystopias, Author ex machina (In which the blogger asks the question "Is the character/emotional story more important to you than plot plausibility, world-building, or the trust you can place in the author?" Well put. ), and Agent Michelle Andelman on Dystopian Fiction. And go back a couple of months for Dystopian And The Apocalypse: What's The Difference? Are We Talking An Apocalyptic Story Or An Invasion Story? I have mentioned many times that I'm not that fond of apocalyptic stories. However, I was going through the files today, getting ready to submit an old favorite short story, when I realized that many would probably call it apocalyptic because it it takes place in a post-civilization-as-we-know-it world. Then I wondered if it is a invasion story. A lot of popular apocalyptic fiction deals with humankind doing itself in, not suffering through an invasion and being destroyed from without. Yes, yes, that's the ticket. Gone Fishin' is an invasion tale. That's my story, and I'm sticking to it, because I much prefer aliens, no matter how dreadful, to depressed residents of a new world order. Is Every Book With A Teenage Main Character A Coming Of Age Story? I think of myself as hating coming-of-age stories, mainly because they are so oppressively self-important and pretentious. "I am about something big and serious--just like the last half dozen coming-of-age stories you read." However, the author of Why are American writers so good at coming-of-age novels? called What I Saw and How I Lied a coming-of-age novel, and I liked it a great deal. But I never thought of it as a coming-of-age novel. I thought of it as classic noir. If you read the comments after Why are American writers so good at coming-of-age novels?, you'll see people throwing out all kinds of titles and suggesting them as coming of age. Thought provoking. Is coming of age in the eye of the beholder? Also, why are adult readers so fond of the so-called coming-of-age novel? I think it's because we value being grown-up so very, very much, and in these novels the teen characters are supposed to transition into the adult world, be exposed to something that changes them so they can never be "young" again. Grown-up concerns are just so much more important to grown-up readers than adolescent concerns. If the adolescent character becomes adult, we think something important has happened. And this link came from Blog of a Bookslut. Kristen Clark Venuti and Jim Averbeck did one of those red carpet interview things at this year's ALA Conference. I'm an appalling person and couldn't sit through a lot of the more meaningful stuff, but I really liked the 20,000 Pyramid takeoff, which you can see in the first video. Also, the interview with Tanita, which is in the bit called Odds and Ends. I wish I knew about Jack London's Dark Side when I, and later my children, were reading To Build A Fire. Or maybe not. It would probably have just raised those painful questions about whether or not I should be reading or enjoying the creations of disturbingly unpleasant people. In another of those bizarre situations where I read something and a few days later read or hear something related, just last week I was doing some research on murders in the first three decades of the Twentieth Century. For some reason, Google turns up an account of London's final months. Thinking that reading about the demise of a writer was a good use of work time, I skimmed most of it. Then today I stumble upon more London. A number of years ago, my family listened to Call of the Wild in the car while on a trip. I was a fan of dog stories of the Albert Payson Terhune variety when I was a kid, but as an adult I tend to avoid them. But the audio version of Call of the Wild was so good that I finished listening to it by myself at home (all the other Gauthiers in the car were unmoved) and became extremely fond of the name "Buck." I brought home a literary treasure on Saturday, another volume from our family member whose home is like an Egyptian tomb as far as relics are concerned. What to Read was written by Thomas H. English, who left quite a paper trail, and Willard B. Pope, who didn't. The book was published in 1929 and is in spectacular shape, suggesting this is another book Ruthie never read. The Foreward begins "What to Read grew out of an attempt to make a series of collateral reading lists for a sophomore survey course in English Literature...The plan finally determined upon was to compile a list of approximately five hundred books from the literature of the world which should be good reading for undergraduates, that is to say, books of high literary merit and equally high contemporary interest." An introductory essay includes the lines "Our times are flooded with printed matter: books, magazines, newspapers, and unceasing showers of pamphlets, tracts, and broadsheets. In the face of the multiplied and multifarious products of the press our powers of selection may be paralyzed." Except for the part about "tracts, and broadsheets," those words could have just as easily been written in 2009 as 1929. What to Read is filled with short descriptions of books with the dates of birth and death of their authors. It leans toward authors of the white, dead male variety, as you might expect from a book of that era. In those days, Marcus Aurelius Antoninus was considered good reading for undergrads, as was someone named Frederick Marryat (1792-1848) who wrote Mr. Midshipman Easy, which got a new lease on life in 1997. Among the few women included are Jane Austen ("In unpretentious stories of middle-class English life, Miss Austen is probably without peer"), and Elizabeth Gaskell, who got her new lease on life, in the U.S., anyway, by way of Masterpiece Classic. The authors say of Gaskell's book, The Life of Charlotte Bronte, "This is the life of one woman of genius written by another." That's beautiful, but then you get to the entry for Katherine Mansfield, which is headed as "Mansfield, Katherine (Mrs. John Middleton Murry)." I am not fond of the stench of old books, but this one hardly smells at all. I think I might make my way through it, in part so that I can talk about books I haven't read. I'm guessing, though, that What to Read is going to contain a good share of books and authors that were considered worthy ninety years ago but have been lost since then. I want to stumble upon those people and works, maybe give them a mention here to bring them back to life for a moment. I'm sure you all recall my discussion of Lincoln Tells A Joke just last month. Right? Right? Well, today was our big visit all the elders day. One of them periodically pulls out books she's had since the deluge, and today what does she take off a shelf but Lincoln's Own Yarns and Stories by Col. A. K. McClure. Our family member said the volume had always been in her family, that she had never read it, but perhaps now she would. I mean, seriously, how weird was that? I've been working on an essay about (among other things) my failure to sell a science fiction manuscript. (There's a good chance I'll never publish the essay, either.) What should I stumble upon this evening but a post at the excelsior file about why there isn't more science fiction in children's literature. Totally related. Leila at bookshelves of doom made me happy by directing me to an article about Shirley Jackson's houses in Bennington. If you click on the photo of the yellow house, you'll be able to see the second home she lived in. I am...reassured...to seem them looking so lovely now, as if that might mean that they looked beautiful and comfortable and comforting when she lived in them, too. This article includes sketches Jackson made of floor plans and exteriors of houses that appeared in her writing. I've been known to do that, too! The Jackson house piece appears at Writers' Houses, a beautiful site. I'm going to try to visit it before leaving on trips to see if there are any pilgrimages I can make. Do some offenders decide they'd prefer prison to reading? I do think the author has a point about earlier generations being able to better tolerate people who couldn't conform to a sit-all-day lifestyle. I caught a moment or two of Anthony Horowitz on NPR last week. Turns out he was discussing his fondness for Ian Fleming and Goldfinger. You can either listen to the program or read a transcript. Oh, and by the way, it turns out the final Alex Rider comes out next year. I like to think I have a few teacher followers. Here's a special post for you. Paying Education Markets describes and links to publications that accept education articles. In case any of you are interested in writing one. I read about this at Practicing Writing. I was wondering if this particular store would get foot traffic and if it can succeed in these hard times and all the usual stuff. Then a day or two later I heard that Barnes & Noble is for sale, which is suppose to be an indication of trouble in big box bookstore land. There's been talk of problems for Borders for a couple of years now. If the big chain bookstores shrink up or even disappear, perhaps independents like The Book Bar will be in a stronger position--the only places to go for those people who still want to look a book over before buying it. I was very taken with the title of Keith McGowan's book The Witch's Guide to Cooking with Children, so I snatched up the audio version when I saw it at the library. I can't claim to have caught every word, but I did feel that I was listening to something different. Different is good. This is an updating of Hansel and Gretel, the basic premise being that the witch from that story has survived all these years while her forest home has become what sounded to me like a suburb. She continues to enjoy her favorite meal, children. Our two main characters, a brother and sister, as in the original tale, have a sort-of father and a real stepmother who would both like to see their young ones land in the witch's stewing pot. How will our hero and heroine escape? Part of this book is set up in the form of the witch's journal. I usually don't care for the journal thing, but it's much more...palatable, shall I say?...when it is being written by a witch describing where she gets the ingredients for her meals. You know, a food memoir! And this book seems to be set-up as the first in a series, something that often sets me off. The ending here is pretty satisfying, though, and avoids being totally serial-like. So I'd have to say this book lives up to its clever title. I think the author of The Author Takes A Star Turn is talking about a different type of book trailer than the ones we're used to in kidlit. Much more talking headish than my favorite trailer, for Shiver. I thought that as talking-head trailers go, this one for Devotion was pretty good. But notice--it includes book blurbs. Damn. They're everywhere. Link from Pimp My Novel. I've been hearing about this new reading study for days. The bit that interests people the most (and which you'll find in the twelfth paragraph of the article I linked to) is that "children improved their reading scores even though they typically weren’t selecting the curriculum books or classics that teachers normally assigned for summer reading." It seems that this study confirmed others (that I don't believe I've heard about) "suggesting that children learn best when they are allowed to select their own books." I know how they feel. No matter how good a book is, when I see it on a reading list, my eyes glazeth over and I begin to yawn. You know, gradeschoolers aren't the only people who get hit with assigned reading in the summer. So do incoming college freshmen, who probably thought they were through with all that. Those freshman reading experiences didn't go over well with the Gauthier boys, but I guess that's to be expected. Our reading at Chez Gauthier is a little on the feral side. In Summer School Slate offered a less "dutiful" pre-college reading list, one the compilers thought would be "better suited to helping 18-year-olds navigate university life." I think I've seen one of the titles, Blindness, floating around my house somewhere, but I haven't read it because, quite honestly, it looks like something you'd see on an incoming freshman reading list. Lynda Mullaly Hunt and I used to belong to the same writers' group. Her first book will be published in 2012. And here's her first author interview, conducted by Jame Richards. I almost passed on this Cynsations interview on marketing because marketing is depressing. But then I saw that the author being interviewed is Micol Ostow who wrote So Punk Rock and thought I would risk being depressed. Ostow's marketing views are not at all intimidating, which is what makes marketing depressing. You don't often hear me talking here about a good writing day, perhaps because they are so few and far between. But a number of things came together today that led me to be more productive. First off, yesterday's post about writing rituals got me to thinking. Perhaps all the Internet wandering I do prior to starting work is only a writing ritual because I call it a writing ritual. Perhaps I could call something else my writing ritual--the so-called "writing meditation" I do in my workbook, for instance. Any kind of meditation sounds more meaningful than checking out some of the slimy newstories that I am too ashamed to admit I read. So, I did that and...Wow! I didn't check out any news sites until 4:00! Seriously, I didn't expect that to happen. I was able to do that, in part, because I happened to finally read the creativity article in Newsweek from a few weeks ago. It indicated that while multi-tasking isn't that useful (something I've heard before) moving from one creative task to another is. So I made one Primary Daily Goal to work on (during the writing meditation mentioned above) and several Secondary Daily Goals. This meant that when the Primary Daily Goal became too difficult, instead of running to the Internet, I went to work on one of the secondary goals. Finally, that Newsweek article also said that some serious exercise can also be good for creativity. Now, I exercise every day, and I have for years. While I do cross-train, sort of, after all this time my body isn't surprised by much that I do to it. However, the last two weekends I went biking. (I'd post a picture, but I really don't look that good in biking mode.) I did thirty miles over two days the weekend before last and twenty-one miles this past Saturday, which is a bit of a push for me because we haven't been able to bike much the last two years. So my mind may still have been experiencing the burn today. Unfortunately, I know all too well that one good day doesn't mean much. I've read that it takes six weeks to create a habit, and I've got to tell you, I've held out that long and still had everything go to pieces later. Nonetheless, I was greatly encouraged today. We'll see what Wednesday brings. I liked So Long, and Thanks by Oliva Judson who, until the end of June, wrote about "the influence of science and biology on modern life" for The New York Times website. In a farewell post prior to taking a year's sabbatical, she wrote about her writing process. Though, really, it seemed more to be her pre-writing process. As with all writers, the actual slogging through the writing remains a mystery. Her post made me wish there was a database for fiction writers where we could go read material related to our ideas. I found So Long, and Thanks by way of Practicing Writing. Procrastinating Writers did a post recently called How to Deal With Quirky Writing Rituals. Reading it has made me to feel anxious, because I've been aware of my writing--or I should say, pre-writing--rituals for quite some time now. I just haven't been able to get them under control. While I can't seem to sit down to work without first checking out a couple of news sites, plus Salon and Slate, I did convince myself for a while last year that I didn't need to spill valuable work time on Internet stories about celebrity deaths and award gowns. Then we stumbled into family chaos and all that Internet crap became the equivalent of tranquilizers for me. But I can start again! Yes! Tomorrow I will not read any articles about Chelsea Clinton's wedding until evening. And if Lindsay Lohan is suddenly sprung from jail, I will wait until the end of the day to get the details.